Rewatching the James Bond films chronologically. These posts have been all about seeing how these films work as a single series. 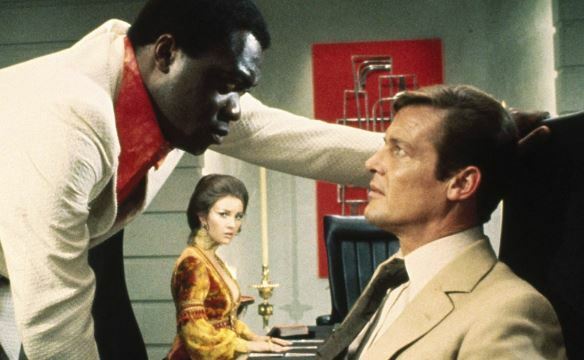 With the exception of Goldfinger, which was a stand-alone, all the movies until now more or less followed a single arc with Bond versus S.P.E.C.T.R.E./Blofeld. 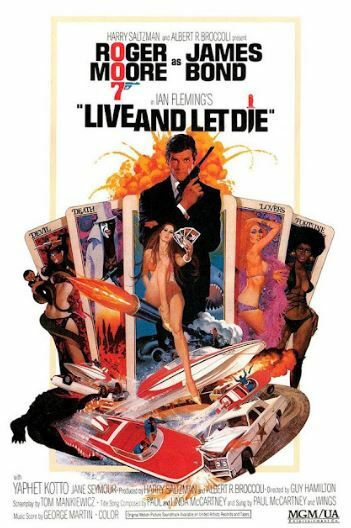 Now, though, we’ve got a new Bond with Roger Moore and a completely crazy new direction with Live and Let Die. Bond blurb: A bunch of British agents are killed in relation to the island nation of San Monique and a mysterious Dr. Kananga. The trail takes Bond to Harlem, then to San Monique (which is Haiti, basically), and then to New Orleans, all for some serious voodoo and drug-smuggling action. Bond background: We get to see Bond’s apartment in detail, when M meets Bond at home instead of Bond visiting M’s office. Bond’s place is surprisingly small, plain, and not at all the suave classiness we associate with Bond. I guess that’s because he’s always travelling and hardly ever there. Bond baddies: Yahpet Kotto downplays Kananga with a cool, calm menace. I like Kotto a lot, as he’s one of these actors who’s always good even when the movie isn’t. 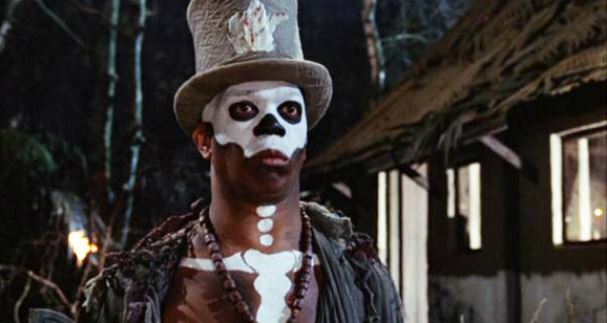 Fortunately, side villains Baron Samedi and the hook-handed Tee Hee are here to bring the over-the-top crazy. Bond babes: There’s a random French girl in Bond’s apartment, and Bond later dalliances with the acts-tough-but-is-easily-frightened Rosie, who gets killed off early on. But it’s Jane Seymour who steals the show as the Tarot-reading Solitaire. Her character and dialogue are ridiculous, but, wow, is she smolderingly hot. Bond best brains: There are hidden microphones everywhere in this one, and Bond has a little doo-hickey that helps him locate them. The baddies employ hidden dart guns, which are also everywhere. Bond has a nifty magnetic watch, which is one of those movie magnets that can somehow decide what metal it does and doesn’t want to work on. 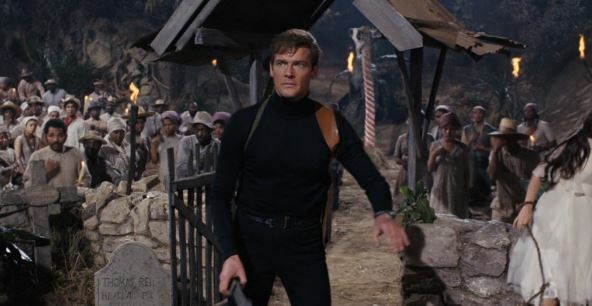 Best of all, though, is Bond’s gas pellet gun which he uses to take out Kananga at the end. The gas pellet causes Kananga to… well, if you’ve seen the movie then YOU KNOW. 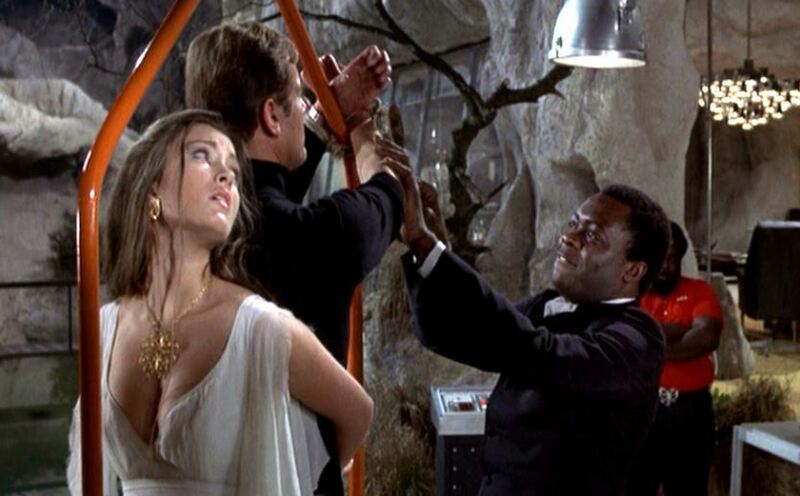 Bond bash-ups: Oh, so this is the one with the Bond-uses-an-aerosol-can-as-a-flamethrower-to-kill-a-snake gag. That’s one of the all-time great signature Bond moments right there. Beyond that, the movie features a ton of amazing practical stunts. There’s the double-decker bus, the running across the alligators’ backs, the trashing of the small-town airport, and an extended boat chase with all sorts of “how’d they do that?” moments. Bond bewilderment: Every long-running franchise has that character the fans hate. Star Wars has Jar Jar Binks. Star Trek has Wesley Crusher. Doctor Who has Turlough. And the Bond franchise? 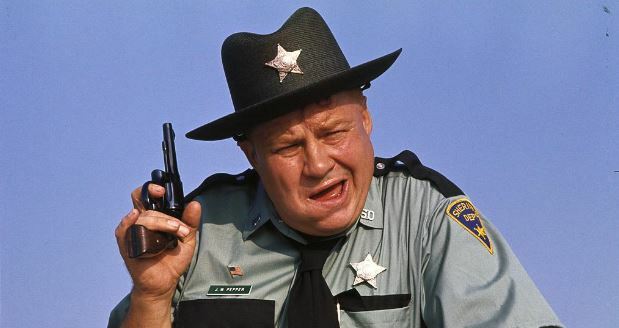 That’d be Sheriff J.W. Pepper, who completely hijacks the middle part of the movie with his unfunny “bumbling country bumpkin” act. Awful. Just awful. Bond baggage: I have it on good authority that I cannot technically call this a “Blaxploitation” movie, but there’s obviously an influence. It’s fascinating in all the ways it mixes and matches elements of Blaxploitation with the usual Bond tropes. Also, the Watergate scandal had just happened, and there’s a running gag of hidden microphones everywhere. Bond babble: This movie is totally bonkers, but I love that it’s totally bonkers. It comes across like a “filler episode,” a throwaway stand-alone tale that’s here to generate some laughs but does nothing of real consequence in the “main story.” As for Moore, he’s just fine. I like that he’s not imitating Connery, but doing his own thing. There’s a lot about the movie that’s groan-worthy, but a lot that’s fun as well.